Dooland de Silva, Bevis Bawa’s heir, is the current ‘keeper’ of Brief. A hearty individual, he has been at Brief for the past thirty years or so and is an able guide to Brief and Bevis. Bevis not being one to celebrate his birthday in his lifetime, Dooland keeps up the memory by a yearly birthday lunch for Bevis’s friends of old. Living at Brief together with his wife and son, himself an architect, Dooland maintains a permanent staff of four to maintain the gardens. You travel, you venture; through narrow winding roads and steep downwards spirals; with many a jolt, many a twist. Finally, a sharp turn around an ancient gravel roundabout and you are greeted: with Brief. Monday, April 26, is the 101st birth anniversary of Bevis, the Bawa of Brief. Brief, this rare gem of art and beauty situated in the most outlandish of places, pays living tribute to its equally illustrious creator. Bevis Bawa’s ancestry rivals his colourful character. His paternal grandfather was an Arab jeweller, wedded an aristocratic lady of French descent. Out of their ten children, one would become a famous lawyer, a King’s Counsel. He was Benjamin, Bevis’s father. He married a Dutch, Bertha Schrader. Bevis was their firstborn, born on April 26, 1909 at the famed Chapman House down Darley Road. Ten years later, his brother, Geoffrey, the legendary Sri Lankan architect was born. Tragedy struck the family, when Bevis lost his father at the tender age of fourteen. He left school and trained as a planter. Recently unearthed sources reveal that the existing ‘Abrelet Division’ in Kalutara, was planted by Bevis’s uncle Fred Bawa, also a planter, and named after Fred’s mother. This six month training in planting, or ‘creeping’ as it was called, would be the only ‘training’ Bevis would receive for the making of ‘Brief’. The turning point for Bevis came in 1929, when he inherited the rubber estate which would later be ‘Brief’. From the very start, he decided that it would be his retreat, the place he would call ‘home’. Following a stint in plantation, Bevis joined the Ceylon Light Infantry. He had the honour of serving as aide-de-camp for the last four British governors and would go on to become a major, at a time when there were only nine Ceylonese majors. Yet the military was not for his taste and he resigned following Independence. 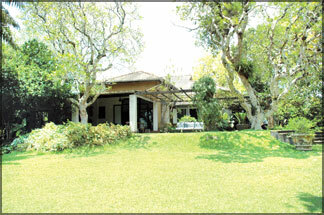 Selling all his properties in Colombo, Bevis made Brief his home. Even while living in Colombo, Bevis had dedicated much time and energy for Brief, which had slowly begun to take shape. After Independence, he threw all his energy to, in his own words, ‘become a gardener’. He sold twelve acres from the original rubber plantation in the aim of ‘raising enough money for the garden’, which ‘frightened’ him by the massive amount it took in the ‘keeping’. Brief today covers an area of two hundred acres. Located just a few miles off Dharga Town on the Aluthgama-Mathugama road, it is not a place that screams away its existence! 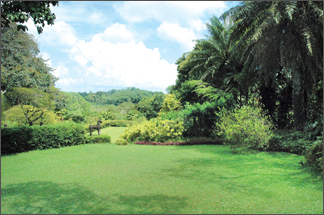 Yet the locals are well acquainted with the ‘Bawa Gardens’ and prove themselves an able guide! 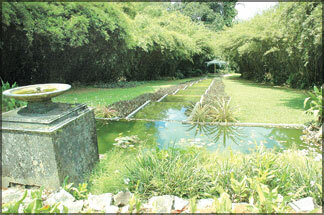 The gardens, which have been open to the public since the 1970s, is a major tourist attraction of the area. The entrance fee for the gardens is Rs.300, Rs.25 for school children and Rs.150 for architecture students. A highly priced visit to the house together with the gardens is also available. A major drawback seen in Brief is the fact that the former gravel road, which provided direct access, has been reduced to eight feet after recent tarring. Schoolchildren arriving by bus are therefore compelled to walk nearly one kilometer. During these years, his brother Geoffrey was in England studying to take up the Bar, a career he’d later abandon for architecture. In his books, Geoffrey would hail Brief as a major inspiration for his own estate, “Lunu Ganga”. Finally, by the 1950s, a long journey was complete. Since 1929, Brief had been developed over a span of more than twenty years to what it is today. Many a time, Bevis would be asked how he planned the garden. His reply was that he never did any ‘planning’ whatsoever! He was no trained architect or landscape gardener, depending solely on his intuition and imagination. Yet, even to this day, ‘Brief’ is a study and inspiration for students of architecture! The name ‘Brief’ with its elusive nature teases the curiosity. One version tells of Benjamin Bawa purchasing it with the proceedings of a single legal ‘brief’. Another story tells of a small hut perched on the peak of the land, surrounded by jungle, which was nicknamed ‘the brief’. What is known is that Bevis certainly enjoyed the ring of his address: Bevis Bawa, Brief, Bentota. Bevis was a well known figure in his day and time, his name still famous on the lips of many a stalwart. He was not just a landscape gardener or an architect; he was a painter, sculptor and writer. Famous for his wit, he would write ‘Briefly by Bevis’ for the Sunday Observer. Even better known was his extraordinary height of six feet seven inches! Brief was a beehive of the artistic. His great friend, Australian artist and sculptor, Donald Friend who just came ‘on a visit’ would stay a whole five years from 1957 to 1962. They would carry out many an experiment of creativity here. The sculptures and worked clay tiles have been attributed to their joint endeavor. George Beven, Arthur vanlangenberg, Barbara Sansoni were among other ‘greats’ who graced Brief. The poem heading this article is one by James Brighton. Illustrated by George Beven, it is one of three paintings wittily depicting Bevis’s life that hangs in the hallway of Brief. A figure hidden away in a corner of one such painting bears an uncanny resemblance to George Beven himself! In the final eight years of his life, Bevis was rendered blind. His blindness did not deter him. Realizing his sight was diminishing, he had kept his eyes closed at times, adjusting himself and saying that he was ‘getting used’ to be blind. Gradually weakening and hating the prospect of being a burden, he quit taking medicine. When his troubled employees complained to the doctors, all they would get was to ‘let him be; He has lived a full life’. And Bevis would live for yet two more years till passing away peacefully in his sleep at the age of 84 on September 18, 1992. Brief was not created to be, and never can be, described in ‘brief’. Seated in the airy veranda, flanked by a courtyard built on rustic columns and beams enveloped in leafy climbers, all one is left wishing is to be engulfed by the surrounding tranquillity and peace. The ground is set at different levels. At times orderly stone steps lead the way to neat square terraces; at times winding ‘borallu’ paths wind in and out of mysterious destinations. A brick arch, carved into a perfect circle, looks over a shady pool. Giant trees and creepers shade a nook carpeted by flowers. A pool with neat steps reflects the sun through the floating twigs. The house is simple, yet not to be ignored. A door leads up through a winding stairway, the darkness illuminated by a stone statue with a lamp atop his head. Pieces by Russel Risebourne, George Keyt, Ivan Peiris, Lucky Senanayake, Lydia Gunasekera, Donald Friend and George Beven peek out of every nook and nick! To behold is to believe! Take a break; take a whiff of Brief!